Global Pro MX Professional Supercross Racing Parts & Accessories. Based in Grand Terrace, CA. Global Pro MX has been in the race industry for thirty years on both the amateur and professional levels. They wanted a clean modern site design that would visually suit their wide base clientele. 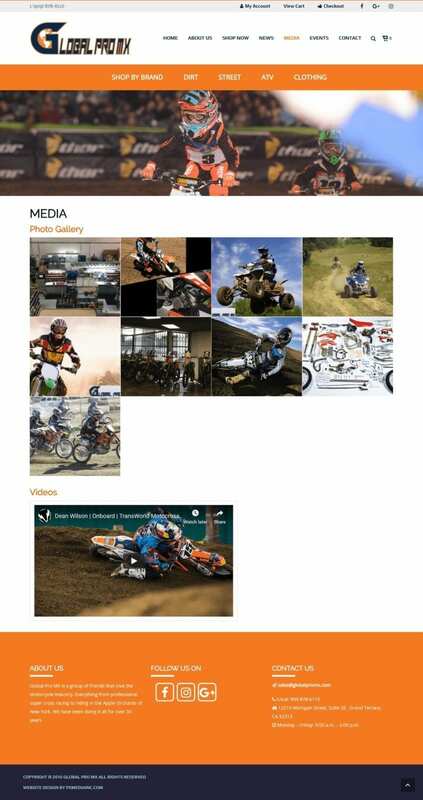 GPM was looking to to develop a new website with the ability to promote multiple lines of motorcycle racing products and services. We suggested a WordPress content management system (CMS) along with a custom attribute selection process using conditional logic. It allows a multitiered drop-down selection path that adjusts dynamically depending on user selection. It removes the unnecessary need for duplicating products with minor differences. key features of the new site: Full Featured Ecommerce, conditional logic. Website build including, every aspect of the programming. Installed and configured the base WordPress CMS and Woocommerce component. Designed all page layouts, graphics, CSS formatting all elements. Managed all QA, browser testing, front and backend bugs. Setup and configuration of hosting account on Linux VPS server. Researched and testing of all plugins, modules and components. Client training for use of CMS along with continued support. Global Pro MX. San Bernardino, California.